Nearfield monitors for the recordist on a budget . . . . Almost a year ago, M-Audio released its first monitor, the SP-5B Studiophile, into an overly saturated market of cheap, bookshelf-sized nearfield monitors. Given the market for which that the SP-5B was designed, it came as no surprise that it received rather mixed feelings among serious users. However, presumably to appease the audience which found the smaller counterpart inadequate, the company later unveiled a full-sized budget nearfield monitor, the SP-8B, the monitor which is the focus of this review. Based from the size and price differences between the two systems, it is obvious that M-Audio succeeded in making the SP-8B exceed the quality of the SP-5B in almost every way, which may alleviate the concerns of those turned off by the SP-5B, but it still may be in question whether the SP-8B monitoring system can compare with other, more expensive full-sized nearfields. Let us further examine the SP-8B now, then, to ascertain whether this monitor is worth your consideration. Glancing at the outer design of the SP-8B gives the impression that it has a fairly simple layout for a monitor in this class. A no-frills 14.97 x 9.5 x 11.82 in. (hwd) MDF cabinet carries a 1" natural silk dome tweeter and 8" polypropylene woofer on the front panel. Also of note on the front is a unique blue LED, which serves as a power indicator, located in the metal mounting ring encircling the woofer. Looking at the back panel reveals balanced/unbalanced 1/4" TRS and balanced XLR inputs, a power switch, volume knob, and a 1.5" plastic bass port. Data that M-Audio provides with each monitor reveals a fairly even frequency response, with a response window of approximately +-3 dB, which is respectable even compared to more expensive monitors. More importantly, there seems to be no large anomalies around the cross-over frequency of 1.8 kHz. However, inspecting the data more closely reveals that the graph only extends to 200 Hz, so while the middle and upper ranges are shown to be fairly even, the accuracy of the bass response is still in question. Thus far, the SP-8B appears to be a standard, albeit simplistic, full-sized nearfield based solely on its design. However, the question that still remains is whether this seemingly standard monitor can truly compare with the competition, and listening is the only way to find out whether the design specifications are meaningful or misleading. Placing the SP-8B in various environments and testing a wide breadth of listening material led me to neither completely love or loathe the monitor. I will begin with the best features of this mixed-performance monitor. First, the stereo separation in the SP-8B, like in the SP-5B, is absolutely superb. The stereo field it creates is quite clear and precise, with a definite sense of 3-D space, and thus placing parts of the mix in the field may be done with ease, albeit the “sweet spot” for the field should be much larger. Still, this aspect of the monitor is still excellent, comparable to the separation offered by more expensive monitors such as the Event 20/20s and Mackie HR824. The detail in the upper frequency ranges is almost is good, meaning that few subtle, treble parts will be disappear on these monitors. The actual response of the upper ranges, which is one of the most commended aspects of the SP-5B, is also clear and non-fatiguing on these monitors, mostly due to the presence of a soft-dome tweeter. The manual asserts that the frequency range extends to 22 kHz, and given my experience, this is not unreasonable. 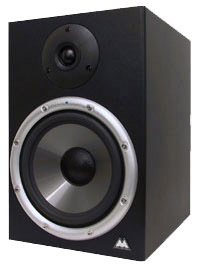 One thing of note that this monitor has in relation to its smaller counterpart: though slightly more defined, the high frequencies are still not quite as sweet sounding (or inaccurate, for that matter) as on the SP-5B system, which will come as a displeasure for those accustomed to the SP-5B. However, the mid and lower frequencies, both in response and detail, do not fare nearly as well. Despite what the frequency graph indicates, the middle frequencies still seem overly prominent, meaning that vocals especially sound harsh instead of crisp. Fortunately, the dominance of the midrange does not create an extremely boxy effect as on most monitors with the same exaggerated response. The detail in this range, furthermore, is quite muddy, and, thus, it seems to take a great amount of time to tweak sound settings in the midrange effectively. The bass frequencies, however, are portrayed even worse, and, in fact, are the weakest point of this monitor. Though the manual suggests that frequencies as low as 33 Hz are present, I only find the useable, reasonably flat response extending to about 50-60 Hz. Beyond that, the bass degrades to undefined, attenuated thumps that are quite like those on cheap consumer subwoofers. The fact that the bass ports are on the rear panel, meaning that extremely low frequencies are diverted from the listener, certainly does not improve the quality of the bass. Yes, the SP-8B has a far superior bass end to them than bookshelf-sized monitors in the SP-8B’s price range, but it is still lackluster in comparison to most monitors of its size. Another shortcoming of the SP-8B is a complete lack of EQ adjusting options. Due to the forward character and inadequate bass in this monitor, I surmise that many people would want to tweak the response in some mixing situations to give a more accurate sound, but, unfortunately, the monitor has no EQ adjustment knobs. Obviously M-Audio wanted to keep the price as low as possible, but the monitor suffers dearly as a result of the absence of this feature. A more successful way the company cuts cost without sacrificing quality: keeping the cabinet strictly functional and not ornate. Overall, this monitoring system is worth testing. It certainly has compromises in order to trim the price tag, but it performs reasonably well given the price difference between this and most full-sized nearfield systems (most cost more than $1,000, as compared to about $500 street price for the SP-8B). If anything, the SP-8B should serve as a reasonably good set of monitors that can be used to A/B the treble and stereo field details in a mix originally articulated on a better set of monitors, presumably a set to which you will upgrade after you have outgrown these.